Wow and just like that the adorable, cutesy cannot-do-wrong two year old is gone…and he’s not even 3 yet!!! I remember this well with Levi and now it’s dawning on me that we are going back into the war zone with Louis. For some reason my boys seem to totally skip terrible twos and become threenagers!!! There is no way in hell there is any compromise…before you could gently coax or ‘ahem’ manipulate them into thinking wearing their gumboots on was a good idea, now it’s an all out brawl! They end up wearing the gumboots but on the wrong feet because they fight for them to be on the wrong feet all the while you feel the grey hairs beginning to sprout on your head. Easy tasks are huge tasks…putting a lid on their drink bottle HAS to be done by them, in their time, their way. Half an hour later after a fit of rage, screams and water everywhere the lid is on the bottle!! You think you have them pegged in the eating department, you feel you know what they like and what they don’t. Nope it’s like their taste buds change daily and they almost enjoy not liking any food anymore! They don’t want to walk anymore…What used to be a fierce independence of walking unchartered territory has now given way to sore legs, tiredness and laziness. You vow not to carry them anymore since they are so heavy but as they scream along behind you in public and attract sympathetic stares from onlookers you reluctantly pick them up and continue walking. They won…again. Bedtime is a mission!!!!!! They used to love naps and going to bed, now there is every excuse in the world to not go to bed and will get up numerous times! But they are so exhausted they NEED the sleep, you NEED them to sleep and they will fight to the bitter end! You love them unconditionally and they know it. They know that it makes you immensely happy when they tidy up so just as you are about to loose your cool they begin tidying up their toys without being asked! So you scoop them up for a cuddle to thank them for being so amazing, then they tell you not to help as they are tidying THEIR way! 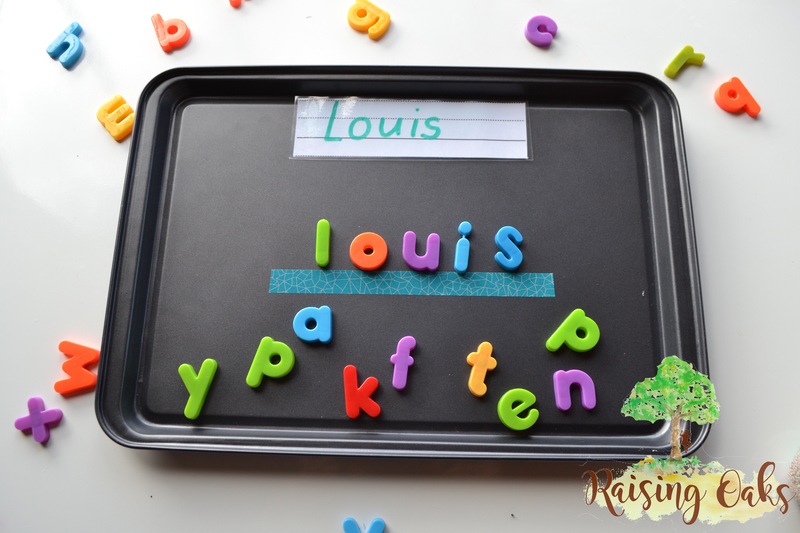 This is a cheap and easy activity for your child that helps them to identify letters, read, spell and write words. So easy I have made an extra for a giveaway that I will share with you tomorrow! I made this activity for $12! It can be re-used throughout their schooling with their spelling words and is an easy way to make a mundane homework activity fun! Of course if you already have a baking tray and the alphabet letters it can be absolutely free! I laminated the word card so it can be reused but you could just as easy write your child’s words on paper and stick it on the tray. 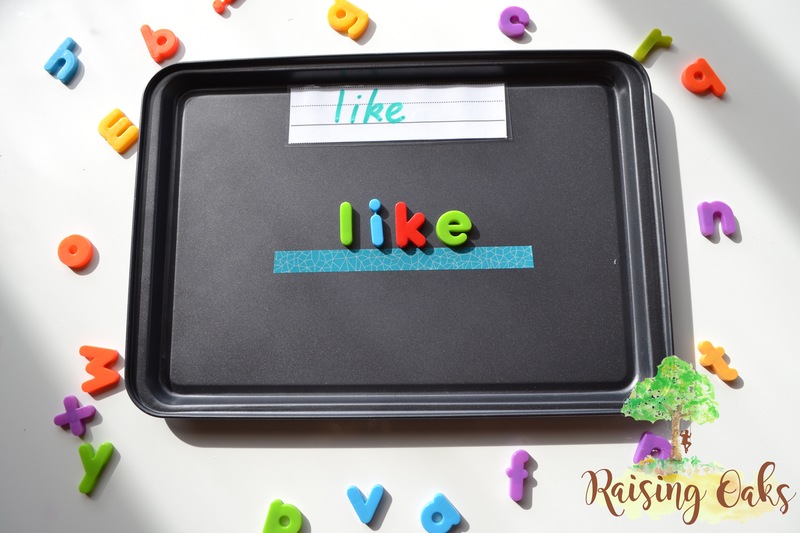 Stick washi tape on the tray to make a line for your child to make words on. You could just as easy draw a vivid line on the tray if you did not have tape. 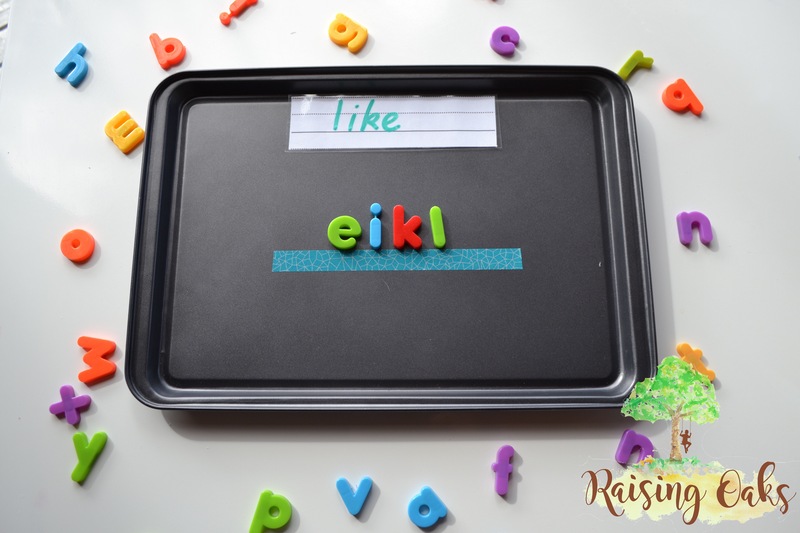 Write the word your child is focusing on paper and stick at the top of the tray. 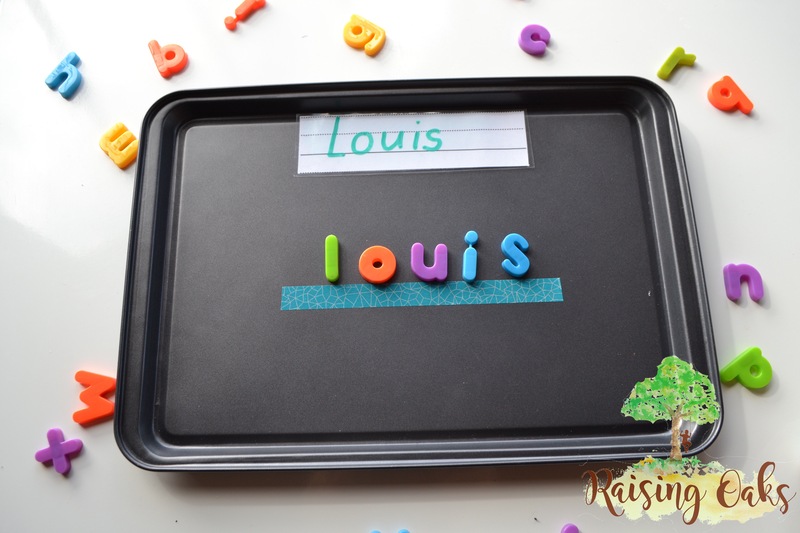 To start with you can have the letters they need to make the word jumbled on the line, this makes it easier for them to order the letters when learning the word. The next stage would be to put the letters jumbled at the bottom of the tray. When they are very confident you can put a group of letters under the line, some won’t be in the word so they have to identify what they need and order them on the line. This activity can also be adapted to learn their names with younger children. Why not give this a try I would love to hear how you go!